When Leyanys Santos, 41, was told that an abnormal growth in her thyroid was cancerous, she had a tough time registering what she had just been told. She had not experienced any symptoms, but her primary care physician referred her to an endocrinologist after feeling a small nodule on her neck during a routine exam and ordering an ultrasound. The endocrinologist then had Santos undergo a biopsy before making the diagnosis of cancer. “I kept thinking about that word (cancer). It’s very tough,” recalls Santos, a mother of two who works as a pharmacist. That moment last December, when Santos’ endocrinologist, Diane Krieger, M.D., who is affiliated with Baptist Health South, relayed the results of her biopsy, was also the first time Santos heard the name of Robert Udelsman, M.D., now chief of endocrine surgery and director of the Endocrine Neoplasia Institute at Miami Cancer Institute. Krieger referred Santos to Dr. Udelsman. At the time, however, Dr. Udelsman was still in his previous role at the Yale University School of Medicine, where he served as surgeon-in-chief at Yale-New Haven Hospital since 2001. Ms. Santos would become Dr. Udelsman’s first patient at Miami Cancer Institute in March. Santos’s case is not unusual. She was diagnosed with papillary thyroid cancer, the most common type of thyroid cancer and the most treatable — but not always requiring surgery. Her surgery in March was a success. “We were able to save half of her thyroid gland because the tumor was relatively small, accordingly, she will not require the radioactive iodine therapy that is often administered after surgery,” said Dr. Udelsman. The most common surgical intervention for a case like that of Santos is to remove either the thyroid lobe containing the cancer (thyroid lobectomy) or the whole thyroid gland (total thyroidectomy). Dr. Udelsman determined that Santos would require the less extensive lobectomy, which would provide her for a much smoother recovery period. Santos said she was genuinely moved by Dr. Udelsman’s interest in her case and was reassured that waiting for him would not jeopardize her chances of beating her thyroid cancer. Thyroid cancers, like almost all diseases of the thyroid, occur about three times more often in women than in men. It can occur at any age, but the risk reaches its peak earlier for women, who are most often in their 40s or 50s when diagnosed. The number of thyroid cancer cases diagnosed over the last 40 years has tripled and continues to increase 3 percent each year. Much of the surge is attributed to a higher rate of diagnoses, using more commonly available diagnostic technology, such as ultrasound and fine-needle biopsies. Ms. Santos recalls that she felt no pain after her surgery and that she was reassured by Dr. Udelsman that everything was fine. She said she was able to return to work three days after her lobectomy. 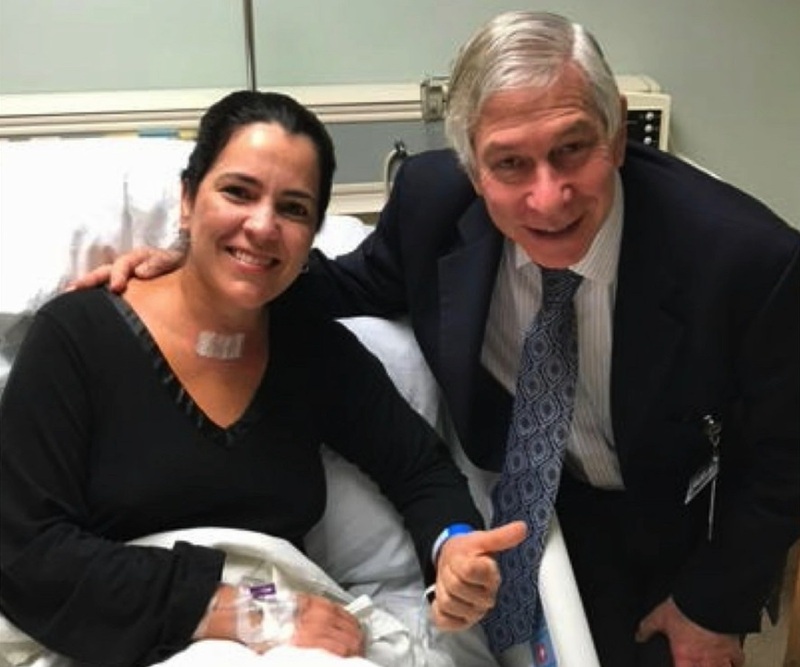 Because her thyroid was not removed, Dr. Udelsman said that Ms. Santos will not require any radiation iodine therapy, which is sometimes prescribed after surgery. Ms. Santos said she is very grateful for the skill and “humanity” that Dr. Udelsman and the staff of Miami Cancer Institute bring to their work.